Welcome to the Lucky Cat Museum! 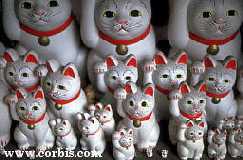 Home of Maneki Neko, Japan's Beckoning Cat! Also announcing a newly opened exhibit! Mingei International Museum, Balboa Park, San Diego. And an excellent new book to go with it! From Talisman to Pop Icon. Photography: Lynton Gardiner & Anthony Scoggins.